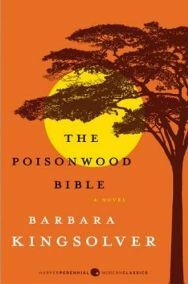 The Poisonwood Bible by Barbara Kingsolver is one of these books, a “modern classic” if you will, which everyone seemed to have read and raved about…except me. I finally caught up and read it recently; having noted a reference to it in a non-fiction book, I was keen to read a novel set in what is now the Democratic Republic of the Congo. The novel tells the story of the Price family; father Nathan, an American preacher, takes his wife and four daughters to the Belgian Congo in 1959 on a mission to spread Christianity. The Poisonwood Bible is the story of what happens in the village of Kilanga, and the aftermath over the next three decades. The setting is all-important in The Poisonwood Bible. The Congo is as much as character as any of the Prices. Its people, culture, landscape, wildlife and weather are ever-present, and the events experienced by the family are always determined by the Congo. It makes for a fascinating setting, but also terrifying – you’re constantly wondering what could possibly happen next, how much more could this family take. The actual characters are a mixed and changing bunch. Nathan Price is the misguided father, essentially the bad guy of the novel, but too pathetic a person to be truly bad. He believes his mission is to bring Christianity to the Congo, but in doing so he overlooks his family, their needs and the danger which surrounds them in the Congo. It is hard at any point to feel any sympathy for Nathan. His wife, Orleanna, on the other hand, frequently elicits sympathy but also anger. She suffers so much in the Congo, but she mainly just puts up with what Nathan puts her family through. I just wanted her to develop a backbone and stand up for her daughters. The daughters are also a mixture. The eldest, Rachel, at seventeen, is a vain girl, concerned with what she is missing at home. She’s not the brightest but is never truly unlikeable, despite her selfishness in Kilanga and in later years. The youngest is Ruth May, aged only five, and of all the family she perhaps copes best with the Congo. She is bold and inquisitive, and is the first to befriend the local children. Both Rachel and Ruth May’s sections (the novel is narrated by Orleanna and the four girls) are fairly light, and usually amusing. In the middle are the twins, Leah and Adah, age fifteen. Leah is a bit irritating, and not easy to sympathise with, as she so often blindly trusts and follows her father, sure that he is wise and right in what he does, not seeing what the others see. Leah however shows the greatest change when she begins to realise that her father is not, in fact, perfect and always right. Adah is disabled, and prone to speaking in riddles. I didn’t dislike her but her manner is so strange that it is hard to like her and connect with her. The story of The Poisonwood Bible is a slow burner. Obviously the move to the Congo and life there is quite an event, but for a long period the novel is about daily life in Kilanga. While this is certainly not dull, you just know that all the little events there are building up to something big. This “something big” is partially revealed in a flash forward by Orleanna, but not the details. You might think that would be annoying, knowing the big event in advance, but because the details were not given, I found I was going mad reading so I could find out exactly WHAT was going to happen. When it does happen, it is so fast that it takes your breath away and you’re left wondering what just happened – did that really happen? I had to read back over it for it to sink in. This event is the hinge of the novel. The political situation in the Congo was already unstable, and following this one event in one family, it continues to worsen. The course and settings of the novel change completely afterwards, and the timescales change too. From an account of daily life, it gradually moves to a more spaced out story, with gaps of years between episodes. The politics of the Congo are ever present, although news of the outside world is scarce in Kilanga. As much as events are shaped by the physical nature of the Congo during the family’s time in Kilanga, when they leave the political nature takes its turn in steering events. The Poisonwood Bible is very much a novel about the Congo, and I want to know more about this fascinating country with such a sad history. I wasn’t quite so blown away by the novel as I expected, given the hype, but I thoroughly enjoyed it. The story and setting made me think, and have stuck in my mind – surely a sign of a novel worth reading. One Comment on "The Poisonwood Bible"
I think this book is a fine piece of work, blending the personal and the political effectively. It is a study of imperialism, certainly, but it is more than that because it captures the cultural collision in a vivid way. It is more than just a ‘good read’, it really makes the reader think about international relations and religion. It could be read alongside ‘Things Fall Apart’ by Achebe (spellcheck) which tells the story of imperialism in Africa brilliantly from ‘the other’ side. I think that some authors do acquire ‘hype’, but this should be forgotten about when we read if possible.